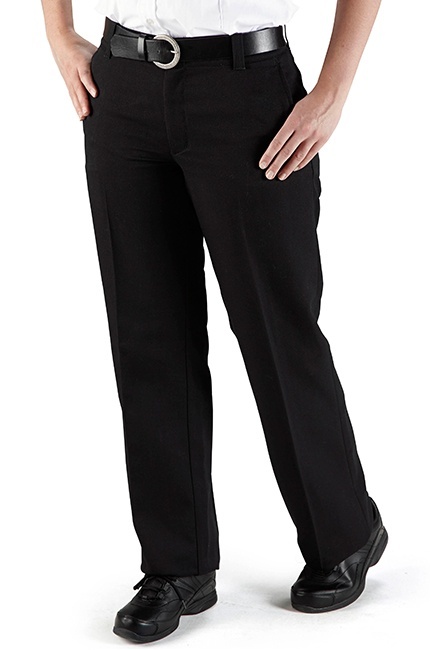 The LION Women's Cut Pants are specifically designed for women and are NFPA compliant. Cut for Women: Lower-waist and fuller legs make pants more comfortable for female frames. Shorter Inseam: Pants feature shorter available inseams. Individual Adjustment: Internal take-up stars on waist enable custom fit. Customization: Available in Nomex, Tecasafe, Cotton, or Poly/Cotton Fabrics. Female Fit: Lowered waist, fuller legs and custom adjustments for a perfect fit. Reinforcements: Double hook and eye waist closure, triangular bartacks on pocket corners. Smart Design: Permanent silicone creasing, navy and black available. Compliant: LION’s female StationWear pants are NFPA 1975-compliant.